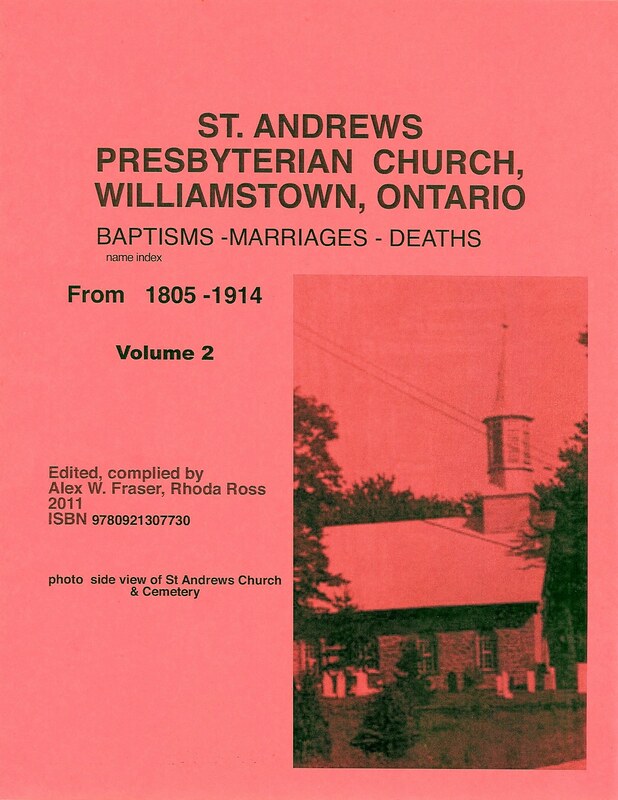 St. Andrews WMST B. M. D.
MacLeods of Glengarry 1793 - 1993 http://thereview.ca/page/review-boutique scroll down to item. $49.00 + $14.50 P&H for total of $63.50 Canadian funds. 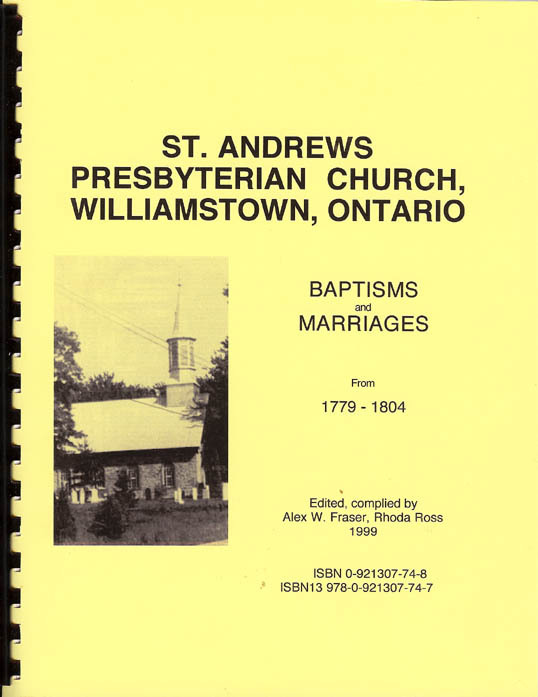 This work reproduces the Church records of St. Andrews Presbyterian Church, now United, situated in Williamstown, Ontario for the period 1779 - 1804 for baptisms, marriages and some deaths. The listing are in chronological order, Baptisms, Marriages, Deaths when listed, by year. We have, also, cross checked this work with the original handwritten records on microfilm. Their is an extensive Name index which has numerous references to other sources. A few of these references are in part. William D. Reid's Loyalists in Ontario; Gravestones of Glengarry Volume 1 and 2, the Duncan McKay 1756 -1810 of 6th Lancaster Township family history. There are about 700 footenotes to additionals sources. MARY MCPHIE, DAUGHTER OF ANDREW MCPHIE, AN IMMIGRANT LIVING ABOVE POINTE CLAIRE AND OF ANNA MACMILLAN HIS WIFE, WAS BORN ON THE 17TH DECEMBER 1802 AND BAPTISED ON THE 10TH FEBRUARY 1803. SNYDER, David(579) Lancaster	B3-1794 Jan 5	born ? This reads: David Synder B3 1794 baptised Jan 5, date of birth not listed & son of Jeremiah & Katharine Snyder of Lancaster township. Bi-tron; Never pay for Fuel Again Get paid to use this product.